I wanted to let you know I’ve begun my own Stampin’ Up! demonstrator blog. I’m very excited! The site deals entirely with Stampin’ Up! products and just a few of the zillions of project a person can make using our rubber stamps, decor elements, accessories and more! As a stamper (and a demonstrator) I love to create cards, scrapbook pages, 3-D items and more! Ever since I was a little girl I’ve always enjoyed making things and even trying to sell them. My one friend, Jamie, and I used to get together and make silly little things out of paper and egg cartons. We’d then set up a table along the road and try to sell our treasures. Unfortunately, we never did very well but I think it’s safe to say my creations have improved since elementary school! 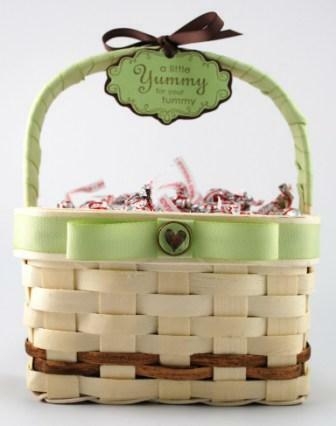 The basket pictured here is one I bought at Michael’s a revamped using the ribbon bundle customers can get for free during our Sale-A-Bration. In brief, Sale-A-Bration is a sale during the months of February and March when you can get an unlimited number of free stamps or other items for free! For more information about Sale-A-Bration you’ll want to visit my blog where I’ve spelled it all out. One thing you’re liable to find a lot of on my blog will be scrapbook pages. I enjoy scrapping my children’s pictures and I have a Scrapbook Club in New Freedom, PA that I lead. We meet once a month to create six 12×12 scrapbook pages. This particular page you see is one my club will be creating during the month of February. 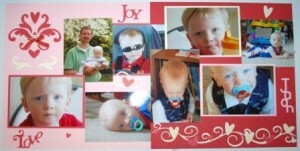 Several of the images were created using the Sizzix Big Shot which is now carried by Stampin’ Up! We actually have some of our own exclusive Stampin’ Up! dies. Now I can’t foget to mention the handmade cards. I make a lot of cards and teach a lot of people how to make handmade cards. 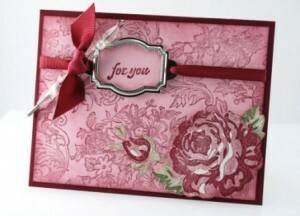 Here is one example of a card using A Rose is a Rose stamp set that I made yesterday just for the fun of it. There are and will be many more examples on my blog. As I said, the blog is still rather new, not nearly as big as many, but I do write on it each day (and share pictures) and it is growing rapidly. I hope you will visit and check back every now and then to see what is new.